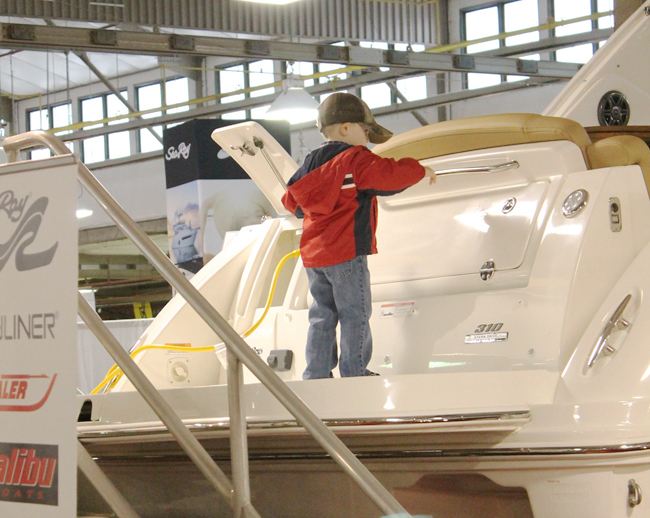 This little fella at the CNY Boat Show will have to wait a few years before he can take the Young Boater Safety Certification training that qualifies 10 to 17-year-olds to legally operate a motorized boat or watercraft alone on New York waters. Credit: NY Sea Grant. Syracuse, NY, February 25, 2019 - The 2019 New York Sea Grant Discover Clean and Safe Boating educational vessel, which was the centerpiece of Boating Information Center at the Central NY Boat Show earlier this month, is equipped to pass a vessel safety exam that provides boaters with a certificate of an approved inspection by U.S. Coast Guard Auxiliary or U.S. Power Squadron personnel. Leading up the CNY Boat Show, a number of media outlets reported about or even from the State Fairgrounds in Syracuse. Video clips from Spectrum News Central New York, Channel 9 Syracuse News CNYCentral and WWNY-TV can be streamed below. Others media outlets, like 93Q Syracuse's (WNTQ-FM) "Street Talk" program spoke with Dave White, New York Sea Grant's Recreation and Tourism Specialist, just after the boat show wrapped up. On the radio program, audio from which can be streamed below, White reminded listeners that "even though the boat show has passed, it’s still not too early to start thinking about planning for the warm waters soon to come." If you don't see the player above, it's because you're using a non-Flash device (eg, iPhone or iPad). You can download the mp3 file by clicking here (mp3). It may take a few minutes to download, so please be patient. Spectrum News Central New York, which covers 25 counties in the State, aired its annual CNY Boat Show segment, filed by reporter Courtney Carter, from the expo on February 16, 2019. Why is the CNY Boat Show in such a prime location. In the clip, NYSG's Dave White says: "When you think about it, we have the [Welland] Canal, we have lakes, river, we have a Great Lake (Lake Ontario), the Finger Lakes ... the list goes on and on." White also discusses the importance of boating safety and related trainings, such as the young boater safety certification that was offered at the boat show. "It's the time of year when I'm ready for summer and everybody's ready to see something other than snow," said boat show manager Drew Wickham. "So, you come to the boat show and before you know it summer is right around the corner. Get on a boat and you'll be at the lakes in no time." According to Syracuse NewsChannel 9 meteorologist Kate Thornton, who reported from the Fairgrounds during the CNY Boat Show on February 14th, the official start of summer was just 127 days away. "So it's not too early to start dreaming of cruising the beautiful lakes of Central New York in your very own boat," said Thornton. This year, over 500 boats were on display in the Expo Center and the Tractor Supply Company Exhibition Center. Thornton says big cruisers are making a come back this year, for travel on the bigger lakes. But there's also a wide selection of sail boats, speed boats and party barges. Show manager Drew Wickham, who is interviewed in this clip, suggests thinking about what type of boat you'd like, if it's a boat to kick back and relax on or a speed boat to travel the waterways. As CNYCentral reporter Laura Hand pointed out, because the boat show was in a different part of the Fairgrounds, the layout was completely different. Still, NYSG's Dave White said regular show-goers would be able to find familiar exhibits, just not in their 'regular' place, with the usual neighbors. And, a bonus for early birds: The first day, which was Valentine's Day, offered the allure of free admission. Hand reminded viewers that The Boating Information Center was the place to catch up on new and updated regulations. One reminder: flotation cushions are no longer the acceptable flotation device in canoes and kayaks, you need to be wearing a preserver of some kind, as well. The show was also a good place to catch up on environmental updates. One such device, a fuel nozzle bib, which looks like a rolled-up athletic bandage, but is actually designed to slip over a fuel nozzle, to keep gas leaks and drips out of the water. And, there was also safety: White talked about the eight-hour boating safety course for 10 to 17 year olds held on Saturday, February 16th. He said that even though the program is for young people, parents and other related adults were welcome. NYSG's Dave White sat down with the hosts of WWNY-TV 7's News THis Morning the week before the start of the CNY Boat Show to reminder viewers that "while it might be the dead of winter, it's not too early to start thinking about boating." During the talk, White highlighted the free boating safety class for youths ages 10 to 17 that was to be offered at the Central New York Boat Show. Sea Grant teamed up with the Coast Guard Auxiliary to teach the class at the state fairgrounds. White also reminded folks that they could learn more about boating safety at parks.ny.gov/recreation/boating. Additionally, White's NYSG "Boating and Marine Trades" content can be found at www.nyseagrant.org/marina. He also has information on Great Lakes shipwrecks at www.nyseagrant.org/shipwreck.